Shillong Lajong FC hosted NEROCA FC in Shillong for their seventh game in the I-League. Lajong hasn't had the best of starts to this I-League season as they languish at the bottom half of the table in the 10th spot. NEROCA FC too have had a poor start to the league as they found themselves in eighth place in the league table before the game kicked off. Both the teams were desperate for a win as a win could have taken both the sides out of the danger zone. The game started with both the teams taking a cautious approach and getting a feel of the opponents. Slowly the game came into life with both the teams creating more than a few chances. NEROCA FC took the lead midway through the first half through Felix Odili Chidi. At the halftime break, the scoreboard read 1-0 in favour of NEROCA FC. Lajong equalised almost immediately after the halftime break through Phrangki Buam. Subhash Singh scored in the 82nd minute to give NEROCA FC the lead in the dying moments of the game. That goal turned out to be the winning goal for NEROCA FC. The scoreboard at fulltime read 2-1 in favour of NEROCA FC. On that note let us take a look at the five talking points from today's game. 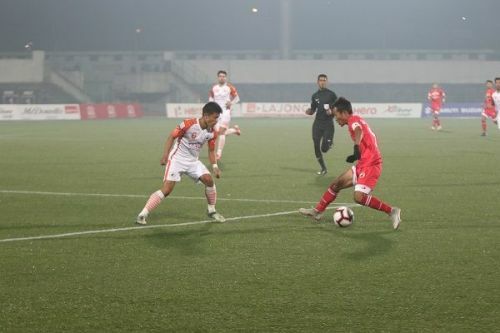 Lajong have been playing some of the best football in the league regarding build-up and keeping possession, but their lack of experience in every part of the field has been a significant issue for them. The lack of experience in the team is also a reason why they haven't been able to convert the positive plays into points. Another issue that has been haunting Lajong this season is their momentary loss in concentration which has pegged them back on a couple of occasions this season. It was evident during the East Bengal game, and then they were punished for the same by Churchill badly, and today they conceded in the dying moments due to the same reason. Kenstar and Rakesh Pradhan were often seen having a lapse in concentration during the game which saw them make some unforced errors. Lajong policy of fielding local and academy players this season means that not much can be done regarding the lack of experience, but Alison will hope to work on the concentration part.